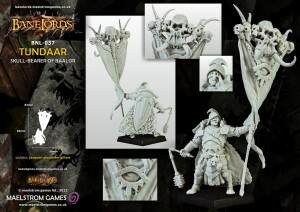 Maelstrom Games has started taking pre-orders for their latest BaneLegions model: Tundaar, Skull-bearer of Baalor. Stefan Kopinski, of course, should not go un-mentioned: it is he that conjured Tundaar’s character, who produced the evil sneer on Tundaar’s face and the amazing posture of a warrior that looks like he wouldn’t be very good company on a night out and would, like as not, spike your drink with something nasty for kicks. Tundaar can be pre-ordered from the Maelstrom Games webstore right now, with his official release date – i.e., the day he’ll be physically available – being the 8th of September.